The purpose of this lab is to practice composition. We will create a Person class that has a Glasses composite attribute. Create a Person class and a Glasses class. Copy the C++ source code and screenshots into a single Microsoft Word document. Remember to hold down the Alt key when you make your screenshots so that only the active window is copied. Use a personal copy, or access the software at https://lab.devry.edu (Links to an external site. )Links to an external site.. Create a C++ project, and call it Week 4—Composition. 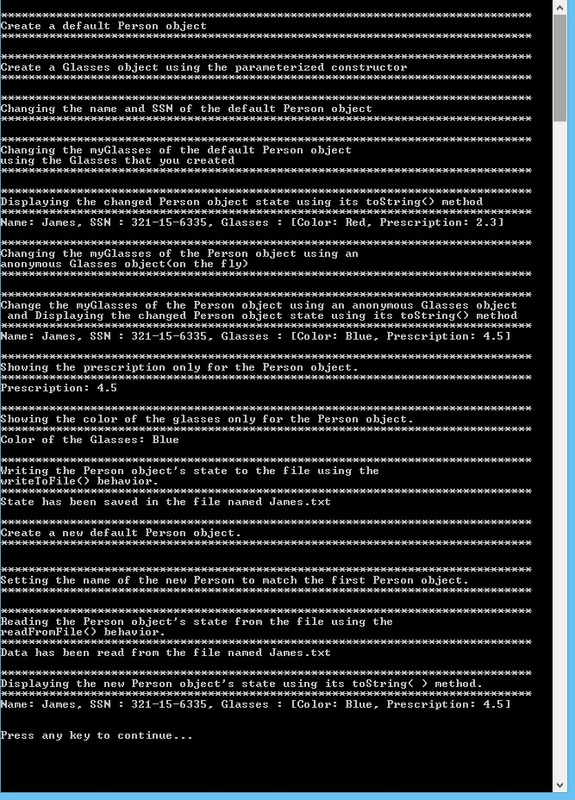 •	Create a Glasses class using a separate header file and implementation file. •	Add the following attributes. •	Create a default constructor that sets default attributes. o	Color should be set to unknown because it is not given. o	Prescription should be set to 0.0 because it is not given. •	Create a parameterized constructor that sets the attributes to the given values. •	Create a destructor for the class. •	Create a toString( ) method. o	The toString( ) method should return a description of the object’s state (e.g., Color: Black, Prescription: 1.75). •	Create accessors and mutators for the attributes. Transcript (Links to an external site. )Links to an external site. In this step, you will create a Person class with a Glasses composite attribute. The Person has a Glasses object. •	Create a Person class using a separate header file and implementation file. o	Name should be set to unknown because it is not given. o	SSN should be set to unknown because it is not given. o	myGlasses should not be created because the attribute line creates a default Glasses object. o	The toString( ) method should return a description of the object’s state (e.g., Name: Bob, SSN: 555-55-5555, Glasses: [Color: Black, Prescription: 1.75]). •	Create a writeToFile( ) method with a string return message that saves the object’s state (current attribute values) to a file using the person’s name (e.g., Bob.txt). •	Create a readFromFile( ) method with a string return message that reads the object’s state from a file using the person’s name (e.g., Bob.txt). Part 1 (Links to an external site. )Links to an external site. – Part 2 (Links to an external site. )Links to an external site. Create a main method for your application to test the functionality of your Composition classes. •	Create a default Person object. •	Create a Glasses object using the parameterized constructor. •	Change the name and SSN of the default Person object. •	Change the myGlasses of the default Person object using the Glasses that you created. •	Display the changed Person object state using its toString( ) method. •	Change the myGlasses of the Person object using an anonymous Glasses object (on the fly). •	Show the prescription only for the Person object. •	Show the color of the glasses only for the Person object. •	Write the Person object’s state to the file using the writeToFile( ) behavior. •	Create a new default Person object. •	Set the name of the new Person to match the first Person object. •	Read the Person object’s state from the file using the readFromFile( ) behavior. •	Display the new Person object’s state using its toString( ) method. Create a Microsoft Word document called Week 4 Lab. At the top, put your information, including your name, course, Week 4 Lab, and the date. Run your application. Take screenshots while your application is running to demonstrate that it works properly. Remember to hold down the Alt key and the PrtScrn key at the same time (Alt + PrtScrn) to take screenshots of the active window only. Paste these screenshots into your Word document. Put the file name for each file in the Word document below the screenshots. Bold the file name, and increase the font. Copy and paste the code for each file below its file name. You should have five files for your project (Source.cpp, Person.h, Person.cpp, Glasses.h, Glasses.cpp). Submit the Word document to the Week 4 Lab page underneath Assignments.